Laser rangefinders are one of the fastest evolving products in the shooting industry. A decade ago, a laser rangefinder capable of 3000+ yard performance would have had the same price tag as a brand new truck and would have been rarely seen outside of a military operation. Even a laser rangefinder capable of 1200-yard performance a decade ago would have come with a hefty price tag. 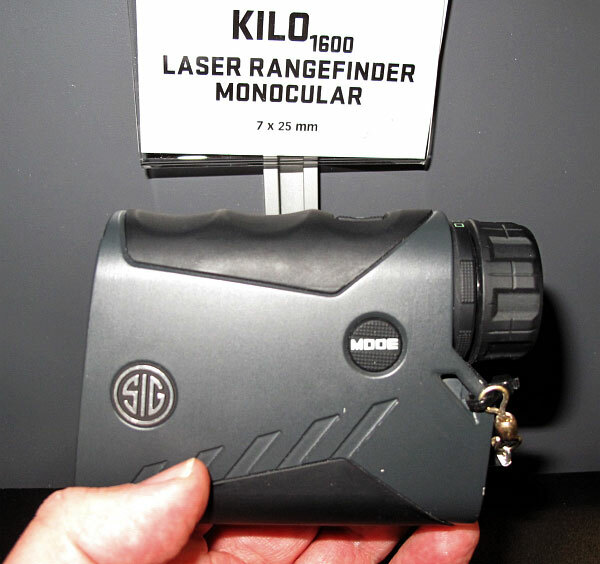 Now in 2019 however, nobody expects to pay more than $450 for a laser rangefinder capable of that rated performance. 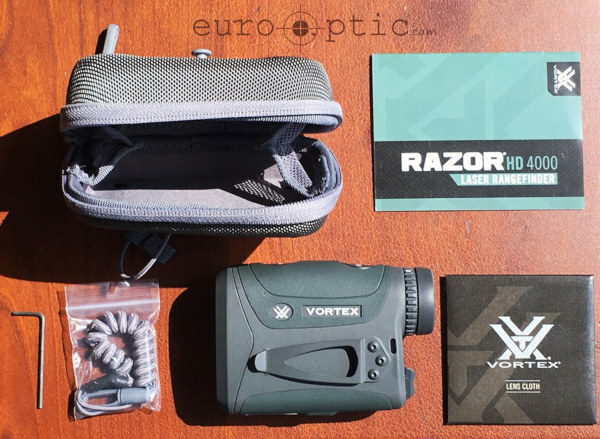 That brings us to today — Vortex Optics just released a brand new laser rangefinder dubbed the Razor HD 4000. The Vortex Razor HD 4000 seems to perfectly fill a void between the economical Ranger LRF 1800 Monocular and the premium Fury HD 5000 Rangefinding Binocular in Vortex’s line-up of rangefinders. Retailing at $499.99, the Vortex Razor HD 4000 is a compact 7x monocular rangefinder. 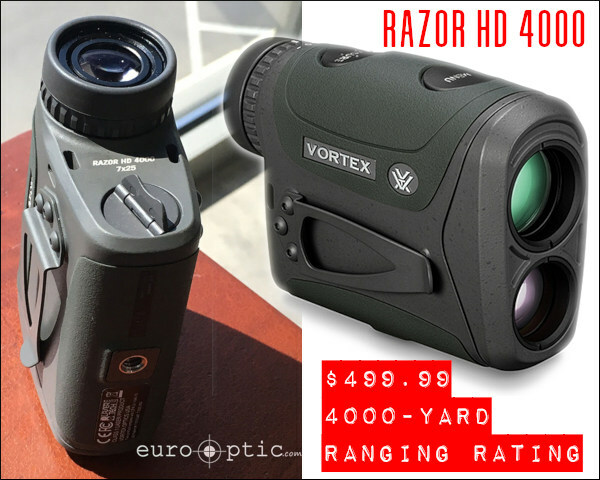 Vortex boasts that the Razor HD 4000 is capable of ranging reflective objects out 4000 yards, trees out to 2500, and deer-sized targets out to 2200 yards. Additionally, the device will deliver measurements as close as 5 yards and can compute angle correction of +/- 70 degrees. The angle correction is a big plus for hunters working in hilly country, where up-angle and down-angle shots are common. We’re please to note the Razor HD 4000 has 1/4×20 female threaded socket on the underside for attachment to a tripod. [Editor: We wish all Laser Rangefinders had this feature.] Another neat but easily missed feature is that the battery cap has a tab that flips out and can be used to unscrew the cap. This makes swapping out the battery easier when you don’t have your multi-tool or are wearing gloves. The unit also comes in a rigid soft case, a wrist lanyard/ tether, and a heavy duty pocket clip. Vortex has recently hit home runs with the Razor scopes, Diamondback Tacticals and Viper PSTs just to name a few. I am willing to bet this Razor HD 4000 is going to be a great performer as well. Share the post "New Vortex Razor Rangefinder Claims Extreme Ranging Ability"
Get a Ruger Precision Rifle in 6mm Creedmoor for $789.00 complete. That price, which includes rings, is great for a Gen 2 model. If you’ve been thinking of purchasing a Ruger Precision Rifle (RPR) chambered for the 6mm Creedmoor cartridge, this is a killer deal. Right now GrabAGun.com is offering this popular tactical rig for under $800.00, in the 6mm Creedmoor chambering. This shoots faster and flatter than the 6.5 Creedmoor — so many PRS guys have switched to it. This is a good choice for the PRS production class, or you can take in to another level of performance with a Pre-Fit 26″ cut-rifled barrel from Krieger. This is the lastest RPR Gen 2 version with the upgraded handguards. Heck of a bargain boys — you can pay $1200 or more elsewhere for the same rifle. Who says there’s a Berger bullet shortage? We’ve found not only a huge assortment of some of the most popular styles like 6.5 140gr Hybrid or 7mm 180gr Hyrbrid bullets in quantities of 100 and 500 but they’re also on sale. 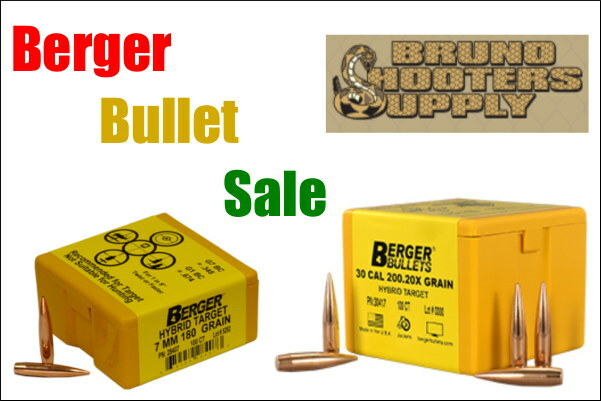 Bruno Shooter Supply is having a huge Berger Bullet Sale and so many to choose from there should be no reason you aren’t prepared for all your matches next year. If you load for precision shooting, chances are you are using either an A&D or Sartorius scale with an AutoTrickler/AutoDrop system. And if you do, adding any of the accessories that AREA 419 makes is the best way to add the next level of stablity, accuracy and convenience. Plus they make your system look so darn good at the same time. 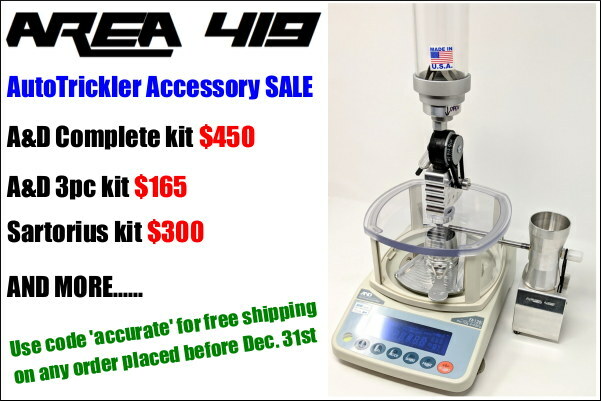 Grab on of these AutoTrickler Accessory Kits from AREA 419 and watch your scale really shine. Use code ‘accurate’ for FREE SHIPPING on any order placed before Dec. 31st. Serious load development requires serious equipment and having a chronograph is one of the best things you can use to test your loads. Now you can score a rare deal on a Magnetospeed V3 Chronograph for only $339.99 and instead of guessing what your loads are doing, now you’ll now. Having a known distance is critical for many diciplines of shooting along with just about any hunting you may do but good rangefinders are tough to find in an affordable price range. 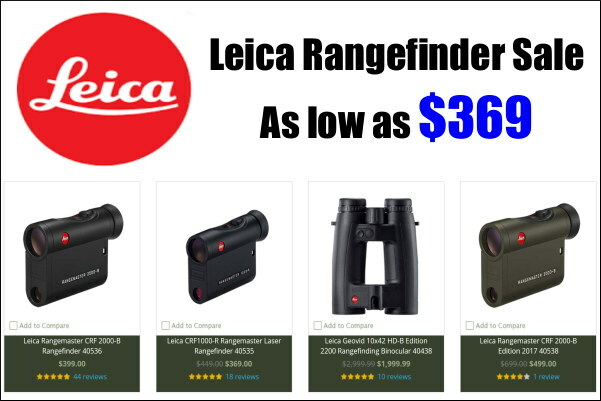 Fear not because we located a killer Leica Rangefinder Sale with units starting at just $369 meaning you’ll never have to worry about taking a shot at unknown distances again. The Leica rangefinders are proven performers, and the Leica Geovid RF binoculars are exceptionally good. A clean gun is a happy gun and since patches are the core of any cleaning regimen why not grab some great patches for a great price? 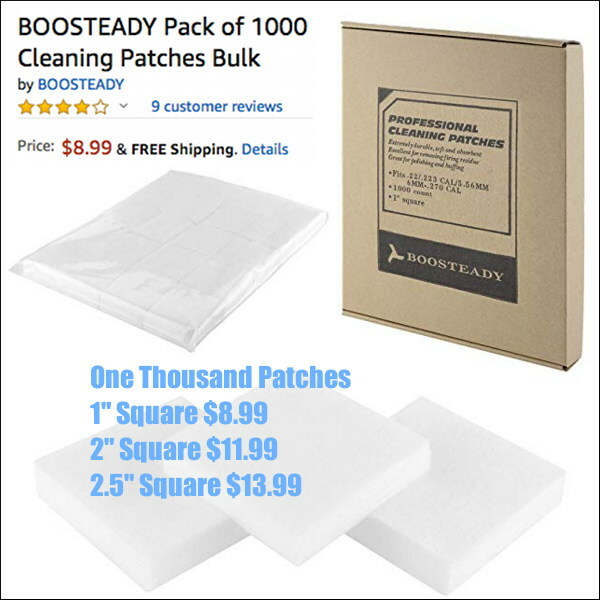 Amazon sells 1000-count packs of Boosteady Professional Cleaning Patches starting at just $8.99 for 1″ square patches — a great bargain for 1000. Now you won’t feel so bad running a few extra patches every time you clean just make sure you got the last bit of crud out. Boosteady patches are very highly rated by purchasers and come in 1″ square ($8.99), 2″ square ($11.99), and 2.5″ square ($13.99) sizes, inside a convenient box. 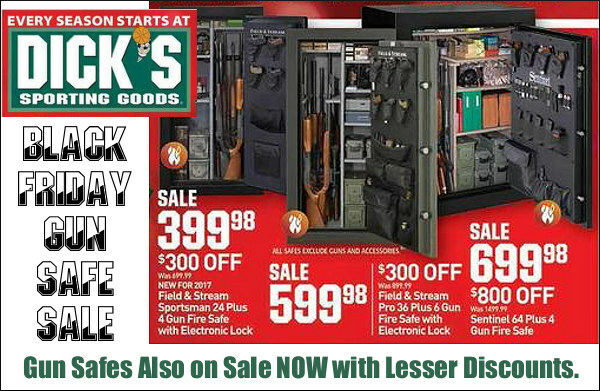 Here’s a $20 Off Promo that can apply to a wide variety of products — everything from rifles to ammo to outdoor clothing. Find yourself something right around one hundred dollars to get the best relative savings with the $20 Off Discount code. We suggest 1000 rounds of SK rimfire ammo ($103.98 non-members). Or maybe a portable shooting bench ($109.99 non-members). 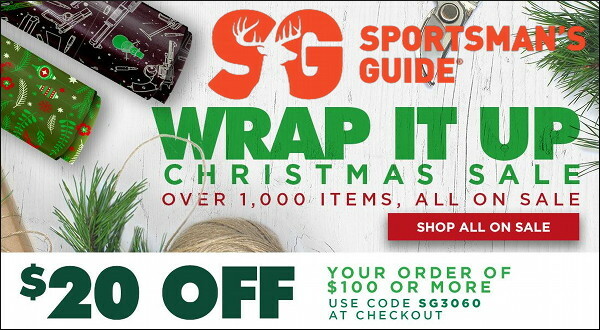 For your $20 Savings, use Code SG3060 during checkout. Sportsman’s Guide Club members can save even more. How many times have you gone to look into a barrel or dark corner of a gun only to find you just can’t see in there? 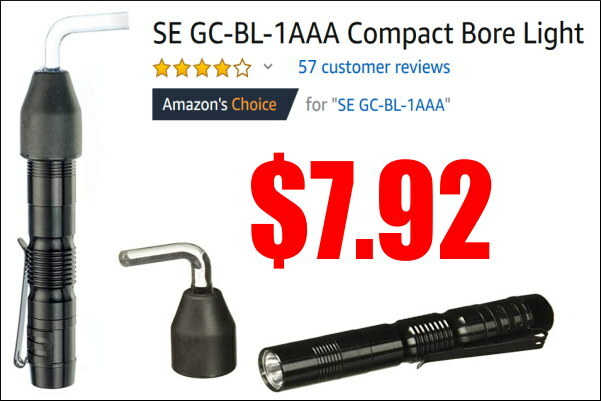 You can easily solve this problem by picking up this Compact Bore light for just $7.92 on Amazon. A bore-light is a “must-have” item for handgun owners, and these are also handy for inspecting dies, rifle chambers, and tool interiors. 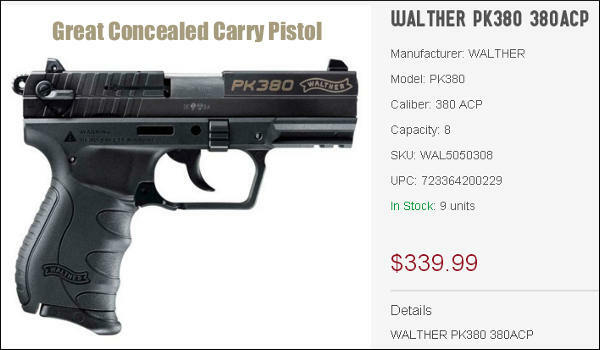 Honestly for this price you should grab a couple so you have one in your range bag and another on your bench. CREDIT Forum Member F Class John for finding most of this week’s deals. 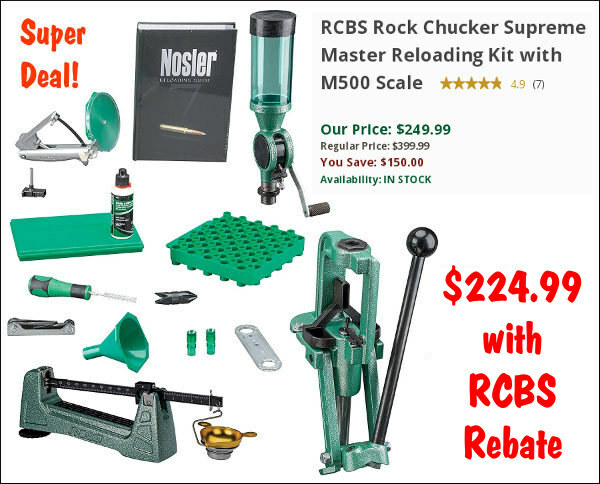 Share the post "Bargain Finder 169: AccurateShooter’s Deals of the Week"
RCBS wants you to “buy green” in November. 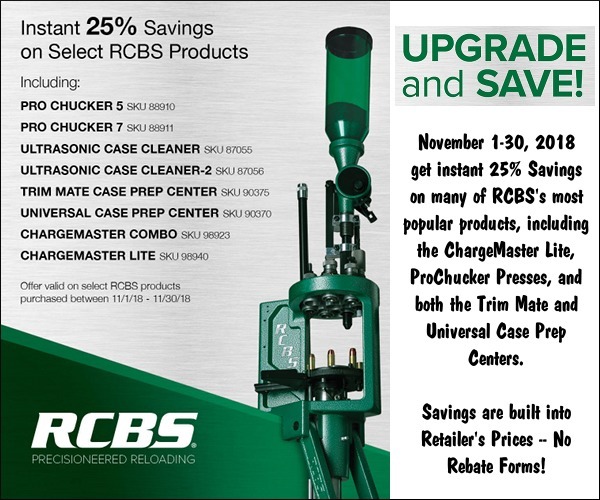 Now through November 30, 2018 you can get 25% Instant Savings on a variety of RCBS’s most popular products, including the ChargeMaster Lite, ProChucker Progressive Presses, and both the Trim Mate and Universal Case Prep Centers. Ultrasonic cleaning machines are also discounted. This is easy-peasy — no forms to fill out and no waiting on rebates. Just shop at your favorite retailer, and you’ll find qualifying products 25% cheaper than last month. 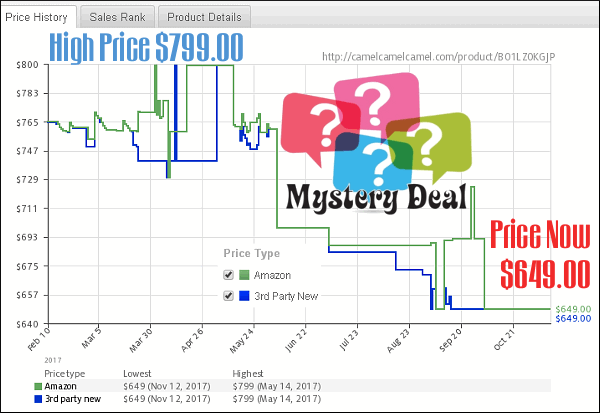 Credit EdLongrange for finding this deal. Looking for an out of the box sub-MOA rifle for under $1000? 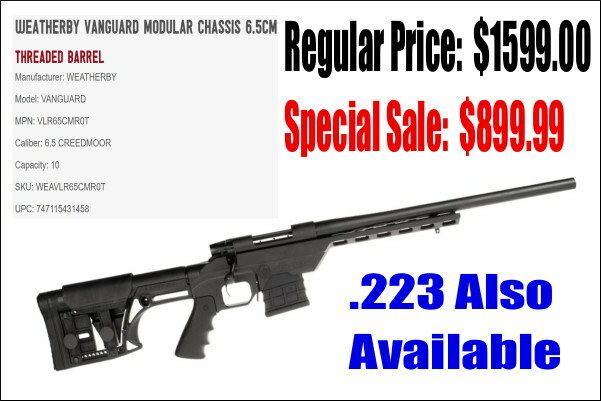 CDNN has the Weatherby Vanguard Chassis Rifle on sale for $899.99. This features a Vanguard action affixed to a CNC-machined, 6061 aluminum chassis with a black, hard-anodized finish in two great calibers for only $899.99. You can also pick up the .223 Rem version $899.99 as well. This price probably won’t last long so grab it while you can. 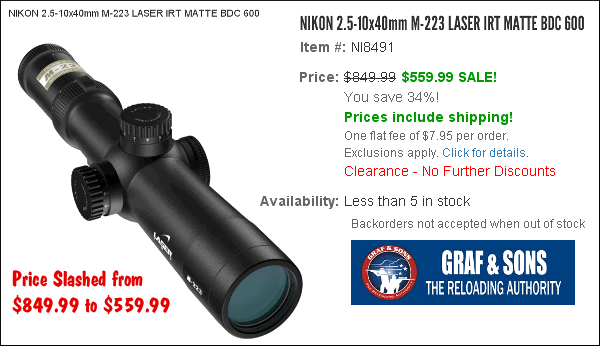 Need a practical mid-power, milrad scope at 60% off? Here’s a deal you don’t want to pass up. 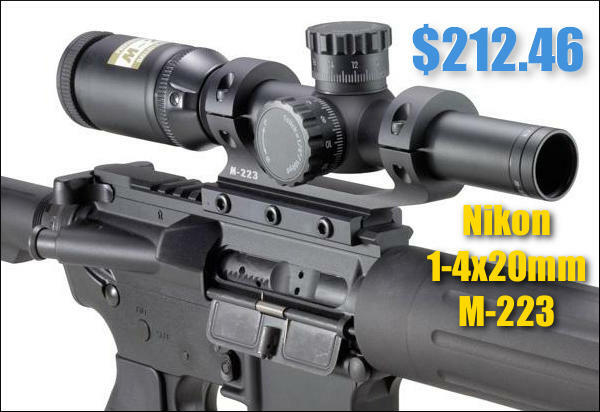 Natchez has the Burris MTAC 4.5-14x42mm tactical scope for just $219.99. The scope’s Ballistic Milling Reticle is a milrad-based reticle with .5 mil and 1 mil hash marks on the horizontal crosshair and top half of the vertical crosshair. These hash marks allow for precise distance measurement, and assist in proper hold-off for wind. 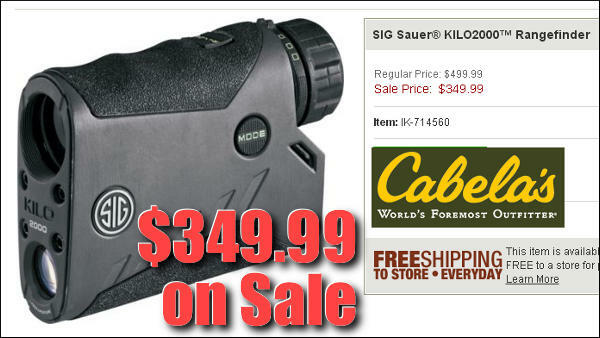 At a savings of nearly $330, this is a steller optics bargain for anyone looking for a milrad scope. Screaming deal? Well, no. But when you need them you’ll wish you had stocked up at this price. Bruno’s has the hard-to-find CCI BR-4 small rifle primers marked down to $47.95. 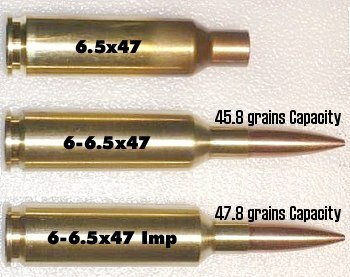 An independent researcher identified the use of CCI Benchrest primers as one of two factors that were the most significant contributors to tiny groups. 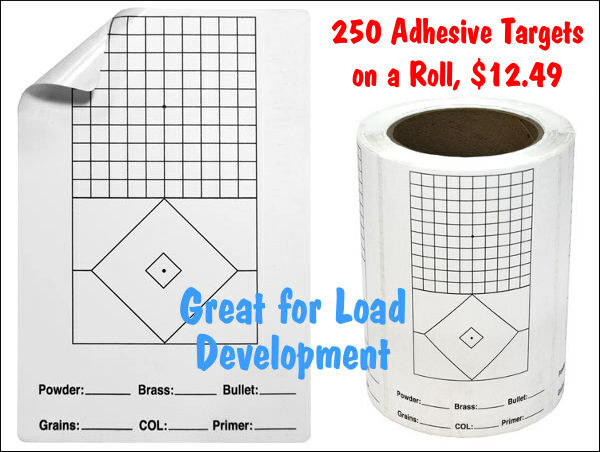 If you’re not using these already and are looking to tighten your groups this just might be the answer. 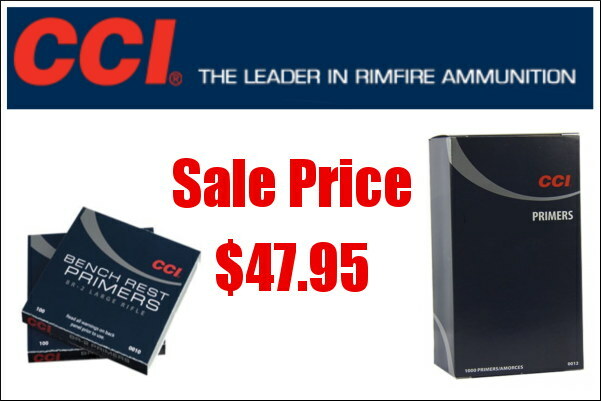 While not on sale you can also find the CCI BR-2 Large Rifle Primers for $54.60. This may be the best deal we’ve seen on the vaunted Leica 2000-B Laser Rangefinder (LRF) with 7-power optic. This unit is rated out to 2000 yards on reflective objects (in real-world use it will laze a deer well past 800 if you can hold steady). The Leica 2000-B features air pressure and temperature sensors, plus on-board inclinometer. Angle correction works out to 1200 horizontal yards equivalent, with the true hold-over displayed in both MILs and MOA. The compact Leica CRF 2000-B weighs just 6.5 ounces and measures 4.5″ L x 2.25″ H x 1.25″ W. It has a waterproof outer shell. Case prep can take forever, so why not save time and your hands with the Trim Mate Case Prep Center. Five gear-driven rotating heads turn the tasks of chamfering, deburring, primer pocket cleaning, military crimp removal, and flash hole deburring into a much easier job. 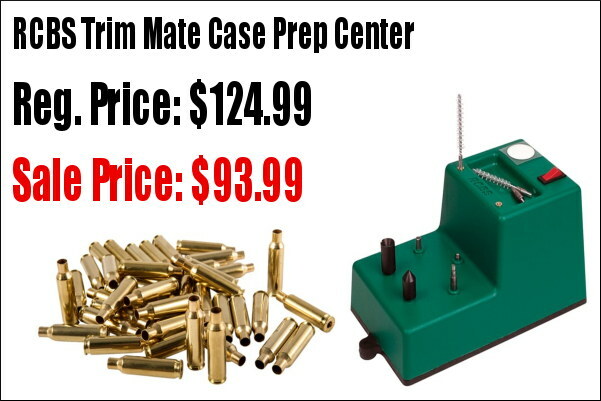 Brownells now has the Trim Mate Case Prep Center on sale for just $93.99 marked down from $124.99, a 25% savings. A power case prep center speeds up tedious tasks dramatically, and your brass will probably come out more consistent. 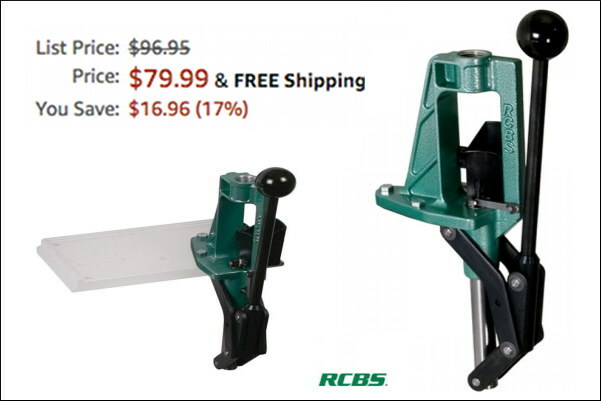 IMPORTANT: This savings is part of an RCBS November Promotion. We like Nosler products. The brass is good, the hunting bullets are legendary, and Nosler match bullets display impressive performance for the price. 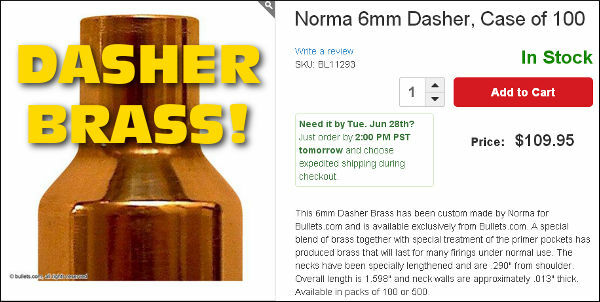 Right now at Midsouth there are substantial discounts on a wide variety of Nosler brass and bullets. Hey 6.5 Creedmoor shooters — take note: 6.5 Creedmoor brass and the excellent 130gr and 140gr 6.5mm RDF HPBT bullets are on sale now. Even if you have a good set of calipers, you may want to get one of these Neiko 01407A Digital Calipers. 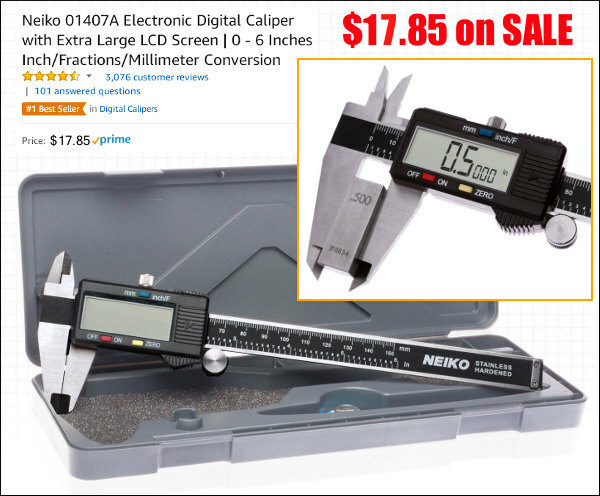 The #1 best-selling digital caliper on Amazon.com, this Neiko tool features a large LCD Screen and measures up to 6.0 inches. With over 3000 customer reviews, this product has earned an overall rating of 4.4 out of 5 stars. It’s hard to go wrong for $17.85, even if you just use these as a spare set for measuring group sizes and case trim lengths. Credit our Bargain Hunter, Forum member F-Class John, who found most of the deals this week. 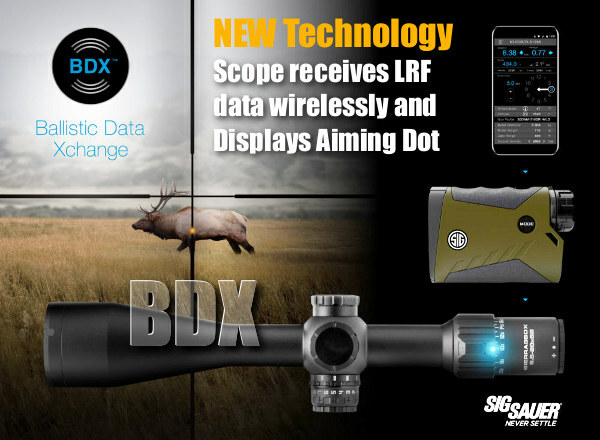 Share the post "Bargain Finder 163: AccurateShooter’s Deals of the Week"
BDX takes target range info from a SIG Sauer Laser Rangefinder, calculates a ballistic solution using Applied Ballistics software, then displays the hold-over info directly in the optic (via a wireless BlueTooth connection). Just dial and shoot. Put the calculated BDX dot on the target and shoot. This ground-breaking BDX technology enables key ballistic hold-over information to be exchanged wirelessly among BDX-enabled Electro-Optics products. 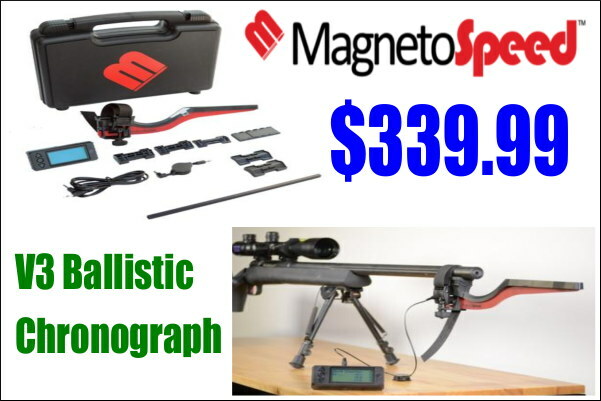 You can buy this as a package with scope and LRF, starting at just $700.00 for scope and rangefinder. To our surprise, these scopes have a normal form factor. They look completely “normal”, with no clunky receiver boxes or extra turrets. BDX riflescopes aren’t bulky or heavy even though they include built-in electronics, level, and inclination detection. “Rangefinding riflescopes of the past have had two major shortcomings: they are either big, boxy and heavy, or extremely expensive. The … BDX system packs advanced ballistics technology into a simple platform that looks just like the rangefinder and riflescope [hunters use] today. It is extremely simple to use. Range a target, put the digital ballistic holdover dot on target, pull the trigger — just connect the dot.” — Andy York, President, SIG Sauer Electro-Optics. How does BDX work? First download the SIG BDX App for Android or iOS. Then pair the KILO BDX rangefinder and SIERRA3BDX riflescope, and set up a basic ballistic profile. Once you are in the field, range your target as you normally would, and the KILO BDX rangefinder will utilize onboard Applied Ballistics Ultralight™ to instantly send your dope to the scope via Bluetooth. Using your basic ballistic profile, the ballistic solution is calculated for your target and will instantly illuminate on the BDX-R1 Digital Ballistic Reticle with windage and elevation holds in the SIERRA3BDX riflescope. A blue LED on the riflescope power selector indicates that the BDX system is paired, and when the reticle has received new ballistic holdover and windage data from the rangefinder. Share the post "New BDX Electro-Optical System Shows Hold-overs in Scope"
Get this Burris Xtreme Tactical XTR II 4-20x50mm SCR Mil Scope for $999.00, a $150 Savings. If you are looking for a new riflescope, spotting scope, laser rangefinder, or binoculars, today’s the day. This Black Friday, you’ll find some of the best bargains of the year. Looking for that Sightron 10-50X for your new F-Class rig? Need a new rangefinder for your next tactical match? 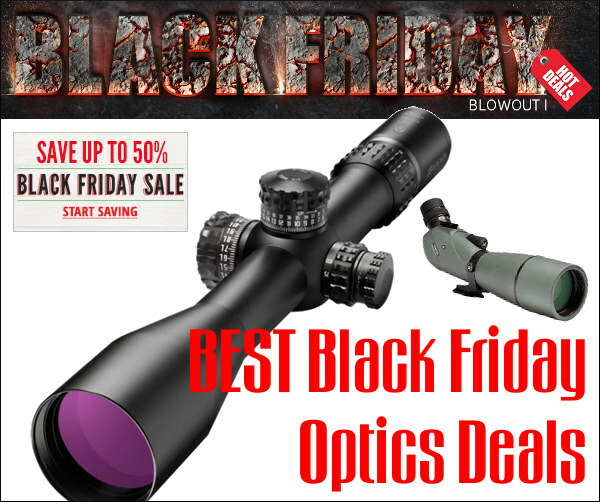 Check out these great optics deals. You can easily save hundreds. 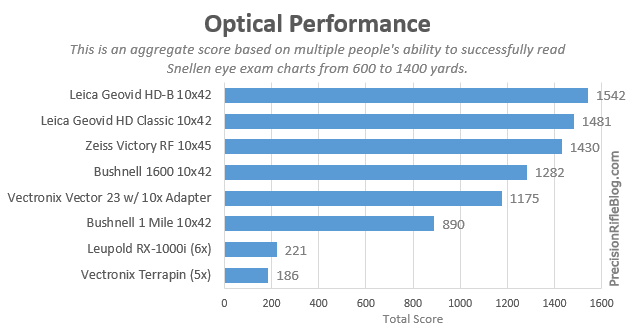 The Sightron SIII 10-50x60mm is THE value leader in a high-magnification competition scopes. Nothing comes close at this price level. 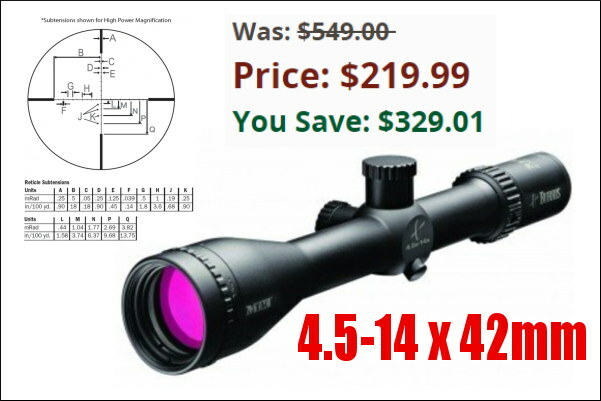 Yes, there are high-magnification comp scopes that may be better (such as the Nightforce 15-55x52mm) but they cost more than twice as much. Can you be competitive with a 10-50X Sightron? Absolutely. At the 2017 IBS 600-Yard Nationals three of the top 10 shooters, including the second overall finisher, used the 10-50X Sightron. Right now the 10-50x60mm Sightron is on sale at Midsouth as a Black Friday Special. 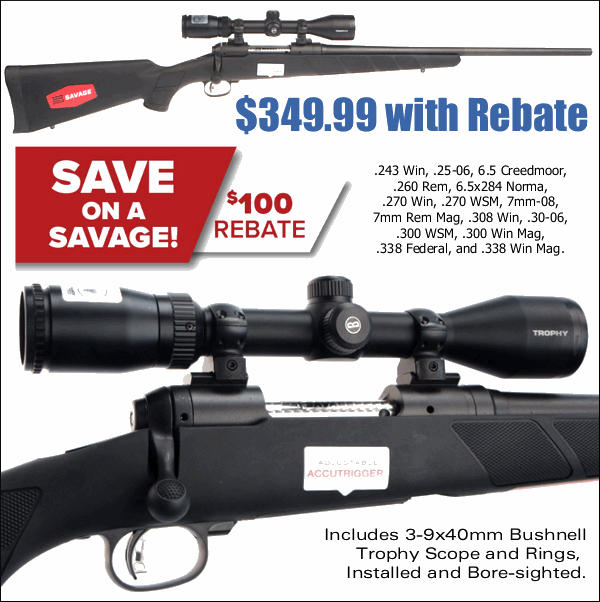 Get the Target Dot Reticle version for $929.99, or the LR Fine Cross Hair model for $949.99. You can also get the Long Range MOA version for just $879.75 at Amazon. READ 10-50x60mm Scope Review. This is an impressive spotting scope that can run with other spotting scopes that cost well over $1000.00. Right now, as a Black Friday Special, Cabela’s is offering the Vortex Viper HD 20-60x80mm Angled Spotter for just $599.99. That is $300 less than the current price on Amazon — $899.00. Who doesn’t want to save three hundred bucks! 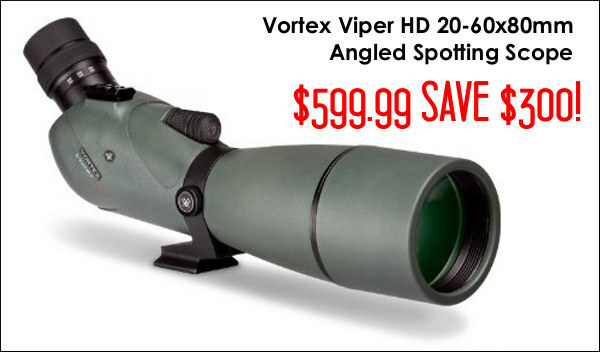 You can also get the Vortex Viper HD 20-60x60mm straight body version for $599.99 at Cabelas.com. As part of its week-long Black Friday promotion, Cabela’s is offering big discounts on Nikon optics. 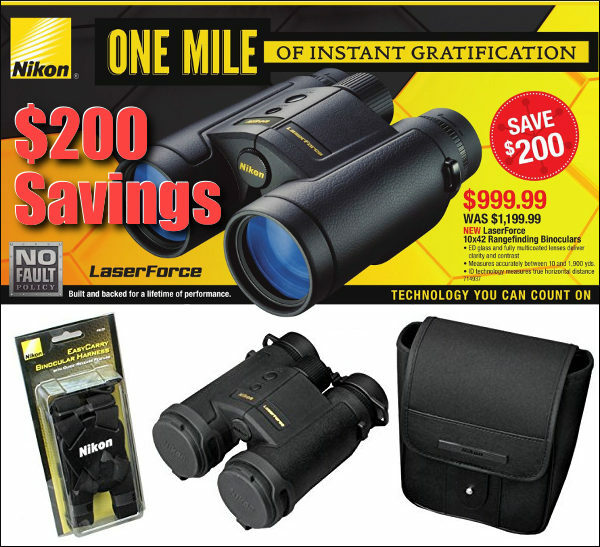 One truly outstanding deal is the 10x42mm Nikon LaserForce rangefinder binoculars — the price has been slashed $200 from $1199.99 down to $999.99. Yes these highly-rated LRF binocs do sell elsewhere for around $1200. These Nikons offer performance rivaling expensive European rangefinding binoculars (Leica, Swarovski) for hundreds less. Clarity is excellent. Ranging ability is very good. CLICK HERE for LaserForce Field Test Full Review. The Zeiss Conquest 6-20x50mm scope would be one of our top choices for a varmint rifle optic, and now you can save $150.00 on Black Friday. The Zeiss glass is exceptionally sharp and the controls are positive. The range of magnification is just about optimal for shooting varmints from 100-400 yards. We also like Zeiss Rapid-Z Varmint ballistic reticle. This features hold-over hash-marks so you can move quickly from one yardage to another. When a P-dog pops up you may only have a few seconds to make the shot. With this reticle, optimized for chamberings such as .204 Ruger and 22-250, you don’t have to mess with clicking for elevation. This scope has a 1″ main tube and 1/4-MOA clicks. Sometimes a budget optic will do the job — for a youth rifle, or a “truck gun” that sees hard use. For a hunting rig, you don’t necessarily want or need more than 9-power, and a lighter-weight scope with lower profile has definite advantages. 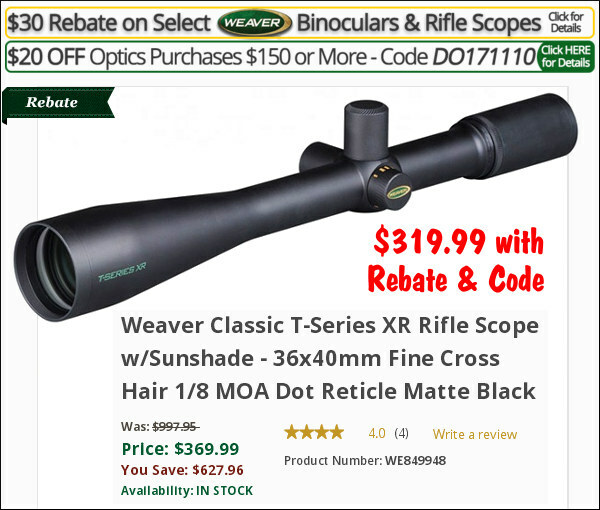 If you are looking for a budget riflescope, check out thes Black Friday Bargains at Woodbury Outfitters. 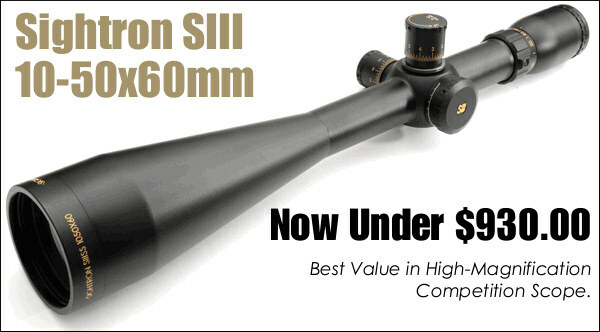 Here are six scopes all under $180.00. 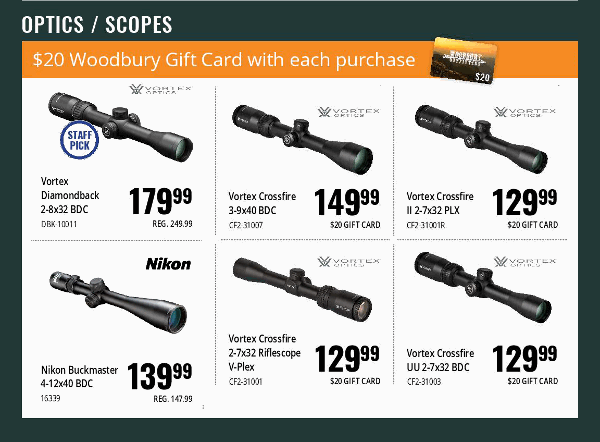 To sweeten the deal even further, every scope comes with a $20.00 Woodbury Gift Card. You can gift that card to a friend for Christmas, or use it on your next purchase. 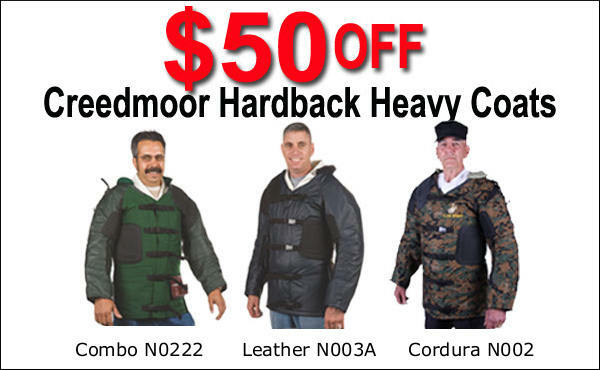 VIEW Woodbury Outfitters Black Friday Sales Flyer. 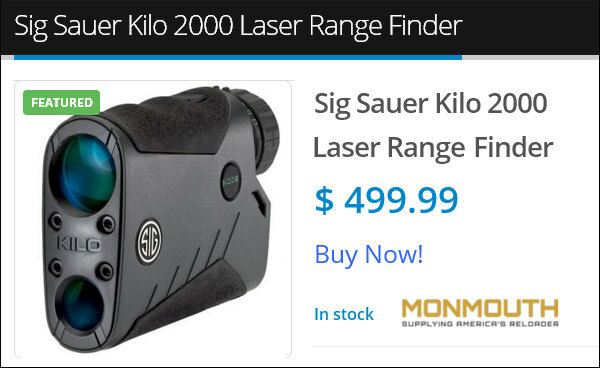 This Sig Sauer Kilo 2000 is a very good laser rangefinder that performs as well as some other brands costing nearly twice as much. You’ll get performance on par with a Zeiss Victory or Leica CRF for hundreds less. User reports on the Sig Kilo LRF have been very positive. 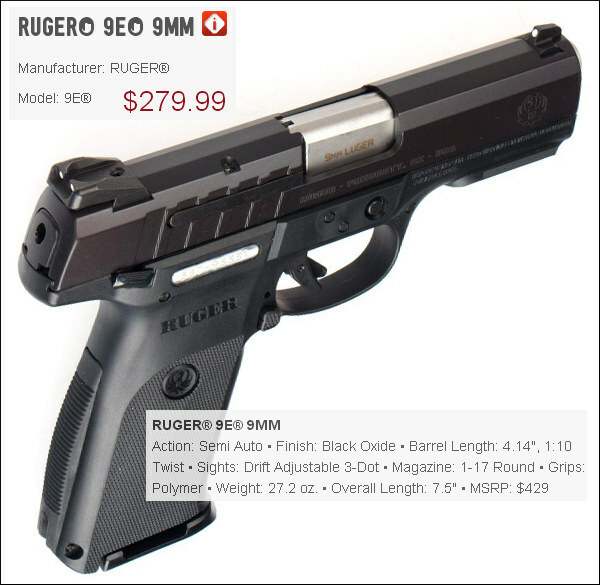 NOTE: There is a newer model, the Sig Kilo 2200, but that costs around $500.00 now. Save 30% with this Kilo 2000 Black Friday deal. 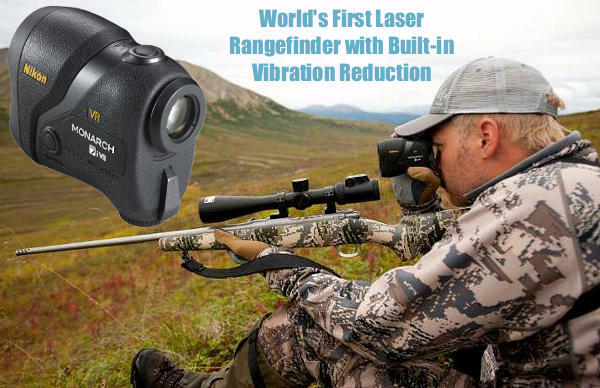 Share the post "Great Black Friday Optics Deals"
It’s about darn time … that somebody offered vibration damping in a laser rangefinder (LRF). This “anti-shake” technology has been available in binoculars for years, but now it’s finally available for a laser rangefinder — thanks to Nikon. Nikon’s new MONARCH 7i VR Laser Rangefinder is the world’s first LRF with automated vibration compensation. Nikon’s VR (Vibration Reduction) technology reduces the effect of external vibrations caused by shaking and hand movements. The system steadies the image seen through the 6X viewfinder, while simultaneously aligning/steadying the irradiated laser beam for faster, more precise ranging. Comment: VR technology IS a big deal for the hunter in the field. Bottom line — this anti-shake technology will let hunters range faster and range distant targets more reliably. The difference when ranging small game at long ranges is quite noticeable. Right now Nikon is the only company offering VR technology in rangefinders, but we expect other LRF-makers to follow suit. Surprisingly, the MONARCH 7i VR Laser Rangefinder is quite affordable. MSRP is $399.95. The VR Function begins immediately when the laser rangefinder is on, meaning there is no extra time spent trying to toggle between settings. Holding down the ranging button allows the user to continuously scan for 8 seconds. A fast measurement is received (in approximately half a second), regardless of the distance, thanks to Nikon’s Hyper Read technology. The MONARCH 7i VR has an effective measurement range of 8-1000 yards and displays measurements in .1-yard increments. In addition, the Nikon’s ID (Incline/Decline) Technology compensates for uphill or downhill shooting angles by providing the true horizontal distance for your ballistics solver. 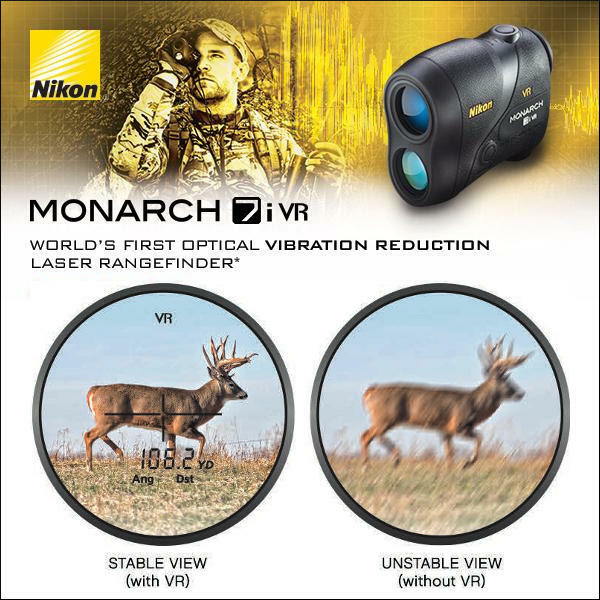 The MONARCH 7i VR represents a major step in hunting technology by helping alleviate the difficulty of keeping the rangefinder steady enough to range distant objects. This issue is partially due to the compact size of most laser rangefinders, which makes it challenging to brace it against a solid object, such as a tree or the edge of a deer stand. The rangefinder’s small size, combined with a strong wind, unbalanced position, physical exertion or just plain-old “buck fever” can make it virtually impossible to hold the target mark of the rangefinder on target and keep it still long enough to get a distance reading. VR changes all that, and we commend Nikon for making this technology available to sportsmen. Share the post "Nikon Offers World’s First Rangefinder with Vibration Reduction"
Leica has introduced a new Laser Rangefinder (LRF), the CRF 2000-B, with a claimed effective range of 2000 yards. Leica says upgrades to optics, internal software, and electronics have extended the range of Leica’s top-of-the-line LRF from 1600 yards to 2000 yards. We expect the new unit may indeed have reduced beam divergence or better error correction. In any event we don’t doubt the Leica CRF 2000-B will range farther than previous models, at least when clamped in immovable test fixtures. However, in the real world LRFs are hand-held, and there’s the problem. We’ve never found ANYone who could hold the ultra-compact Leica LRFs steady enough to range deer-sized objects even at 800 yards. Consequently very few if any folks could really effectively use the claimed 1600-yard range of the previous model. The Leica CRF units are designed to be held vertically. That’s not great ergonomically and this unit was not designed to be fixed to a tripod for extra steadiness. Therefore, we doubt most humans will be able to range 2000 yards with the CRF 2000-B, except maybe with very large targets such as barns or huge storage tanks. It’s just too difficult to hold the little Leica CRFs rock steady. But even if the new Leica Rangemaster 2000-B’s theoretical extended range doesn’t have much practical utility, there are some interesting new features that may make the 2000-B worth its $799.00 MSRP. First, the 2000-B has air pressure and temperature sensors, along with an on-board inclinometer. That last feature will appeal to Hunters, who often take angled shots. The new CRF 2000-B also offers a variety of ballistics readouts — users can select Equivalent Horizontal Range (EHR) up to 1200 yards or Inches of Holdover, and MIL & MOA corrections to .1 decimal point. The built-in microprocessor is fast — data is delivered to the shooter in only 0.3 seconds via the heads-up four digit LED display in the viewfinder. As with previous Leica compact LRFs, the new CRF 2000-B is very light and easy to carry. It weighs just 6.5 ounces and really does fit in a shirt pocket. The 7-power (7X) optical lens is bright and sharp, and we appreciate the fact that Leica made this unit waterproof — it will withstand rainstorms though we certainly wouldn’t recommend dropping ANY rangefinder in a river. 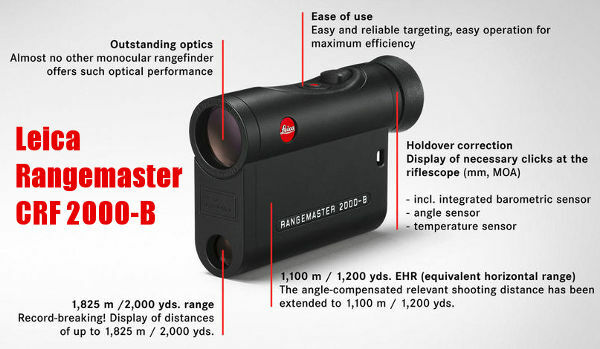 View Leica Rangemaster CRF 2000-B features and specifications at: https://us.leica-camera.com/Sport-Optics. Share the post "New Leica Rangemaster CRF 2000-B Laser Rangefinder"
SHOT Show in Las Vegas is just two weeks away. Here are some of the interesting new products that will debut at SHOT Show. You can find these items and hundreds more new-for-2016 products at the SHOW Show New Product Center. The Newcon Optik Spotter LRF is a combined spotting scope and laser rangefinder — the first of its kind. 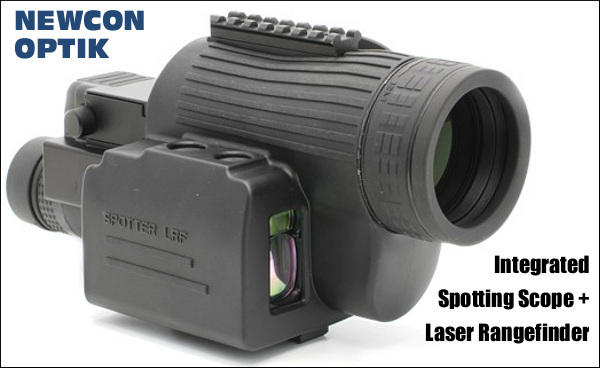 This unique piece of equipment integrates a Newcon Optik Laser Rangefinder with a 15-45X Spotting Scope with etched mil-dot reticle. Newcon Optik claims a 5500m maximum range for the LRF. The integrated scope/LRF is housed in a rugged yet light-weight MIL-SPEC housing. We like the idea of a combined Spotter/LRF. Will other companies try to copy Newcon Optik’s innovative design? The MTS Target System “Pescadero” unit combines a rugged AR500 steel target with a durable electronics and sensor package that allows shooters to view their shots on a mobile App. With on-board power and wireless communication technology, the system will display shot location to the shooter positioned hundreds of yards away. So you can hear the “ding” of steel and then see your exact shot location on your smart phone or tablet. 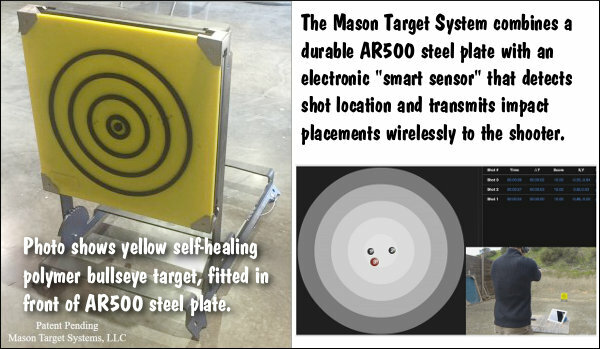 To aid aiming, the Pescadero target can mount self-healing polymer targets to the AR500 steel plate. 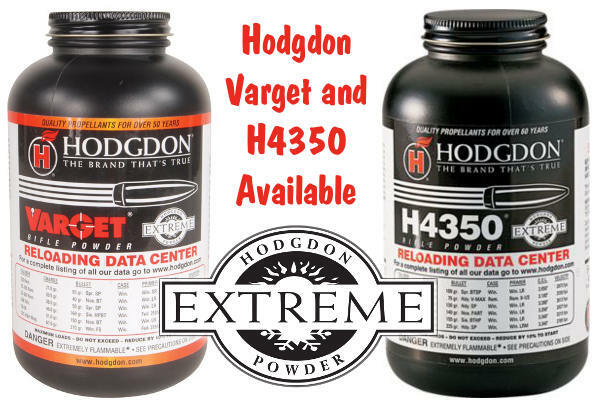 Visit MasonTargetSystems.com for more information. 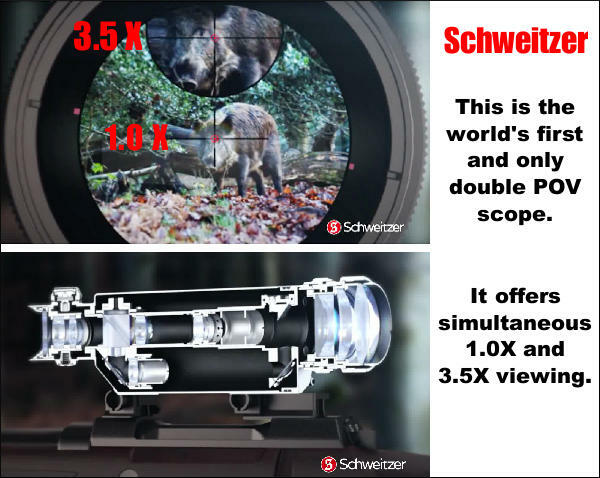 Here is a very innovative new hunting scope that actually displays a 3.5 X view AND and 1.0 X view simultaneously. Schweitzer claims this is the first and only double Field of View (FOV) sports optic in the world. This innovative optical technology doesn’t come cheap — Schweitzer’s Eagle Eye 3.5 dual POV scope retails for $2500.00. No more flaming torches (and burned fingers). The AMP Annealing system anneals through electrical induction. 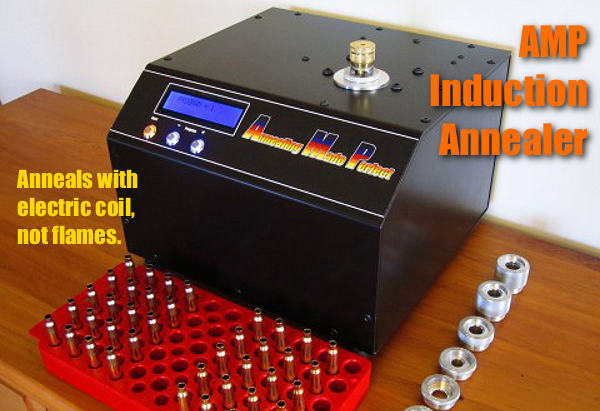 This micro-processor controlled, precision-calibrated induction annealer provides exact and repeatable neck hardness. With the various AMP-made pilot inserts, the machine will handle popular cartridge types from .17 Caliber all the way up to 460 Weatherby. Anneal times are pre-programmed for optimal results. 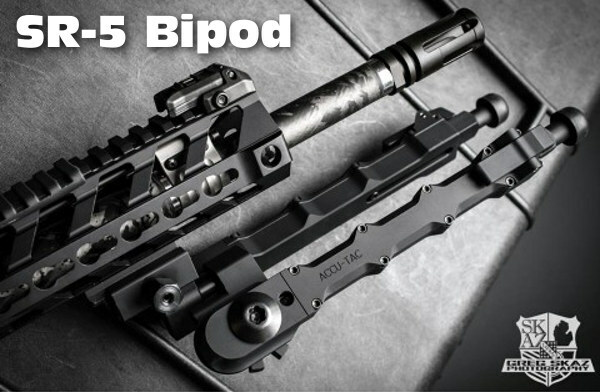 The Accu-Tac SR-5 Bipod is crafted from high-quality billet aluminum. The SR-5 mounts quickly and securely to a 1913 Picatinny rail. The bipod’s wide stance provides good stability. Ratcheted leg extensions adjust to five different heights, and then retract quickly with a one-button retraction lever. Legs can be deployed in a conventional 90-degree orientation, or at a 45-degree angle either forwards or rearwards. Lyman is introducing a new Rotary Tumbler for 2016. Designed for use with stainless (pin-type media) and liquid, this Cyclone Tumbler gets brass thoroughly clean inside and out. 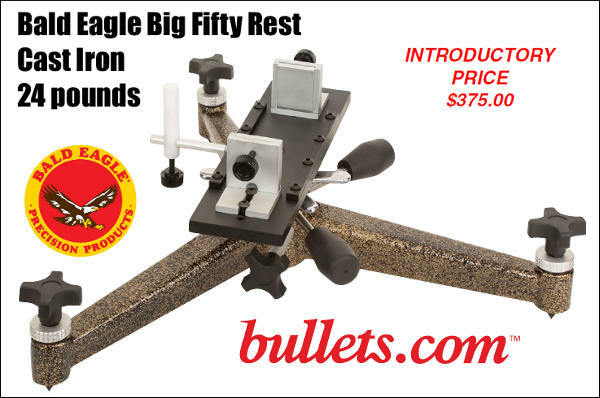 The large capacity drum holds up to 1000 pieces of .223 Rem brass and features a rubber lining to protect brass and greatly reduce operating noise. The included two-piece sifter pans make separating cases and pins easy. This new multi-function gun tool contains 4 driver bits, 2 Torx drivers, 2 Allen drivers, gun pin punch, sight wrench, castle nut wrench, flat screwdriver, bottle opener, knife, and LED flashlight. It even contains a fitting with a male thread connection for attaching cleaning rods. That’s clever. 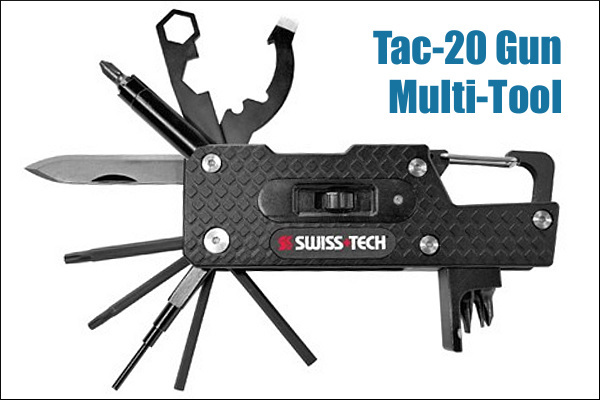 All totaled, the Tac20 multi-tool offers 20 features — that’s a lot of functionality in a small, compact package from Swiss+Tech Products. 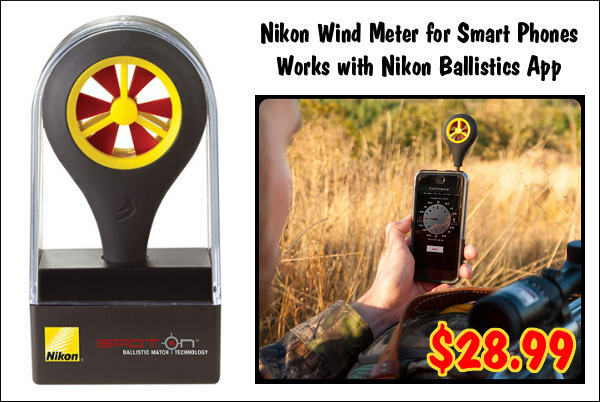 Share the post "New Products Will Debut at SHOT Show 2016"
You knew it was just a matter of time until modern Bluetooth wireless technology was harnessed for precision shooting. Now weather data from a Kestrel and range info from a Vectronix rangefinder can be shared to a remote PDA with GPS capability. The system works via the common Bluetooth networking protocol used for smartphone accessories and computer peripherals. Ballistic solutions are calculated using Field Firing Solutions software. 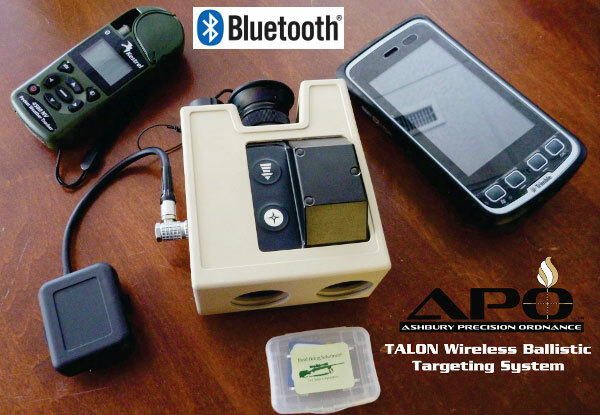 Composed of weathermeter, rangefinder, and hand-held processor (PDA), this three-part TALON Wireless Ballistic Targeting System was developed for Ashbury Precision Ordnance (APO). The Talon System will be introduced by APO at SHOT Show 2015 where pricing and availability will be announced. Here’s how it works — dual Bluetooth feeds (from Kestrel and rangefinder) communicate with a Trimble T41 Juno or NOMAD PDA. The dongle is set up for any Vectronix Laser Rangefinder equipped with a RS232 data port. The enabling technology, a nicely packaged Bluetooth dongle, was developed by a team of U.S. SpecOps personnel. Their goal was enhance operational capabilities by getting rid of wires and cables. They succeeded. Share the post "Technology: Bluetooth-Enabled Ballistic Targeting System"
The R-F Cam Cradle is a smart new product that lets you securely mount a Laser Rangefinder (LRF), digital camera, and spotting scope all on a single tripod. The “game-changing” feature of the R-F Cam Cradle is that it allows you to colimmate (i.e. precisely align) all your optics on the same spot. This way you can simultaneously aim all three devices at a long range target by simply moving the tripod head. A tactical shooter can easily range his target while watching the wind though his spotting scope. And the long-range hunter can range and film his prey as he watches it through the spotter. 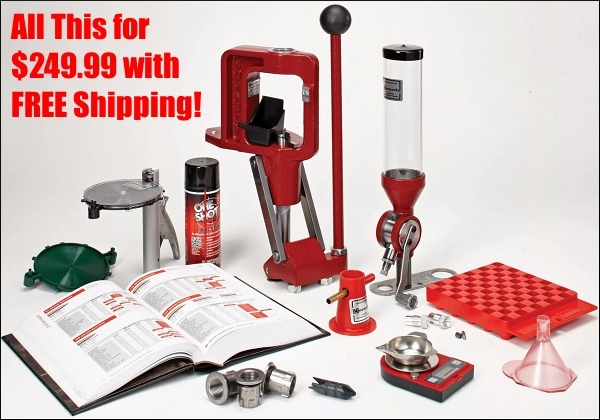 This unit costs $179.95 from DefensiveEdge.net. 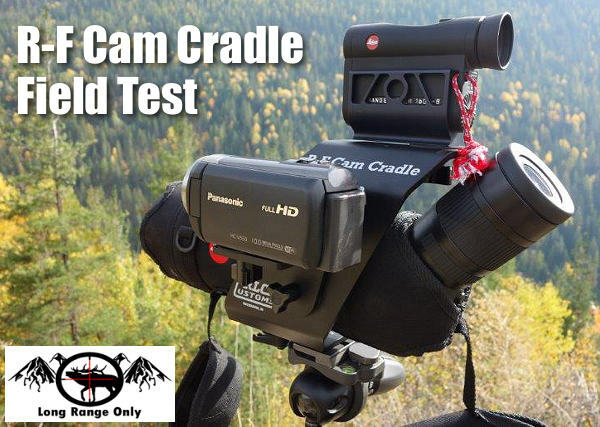 You’ll find a detailed product evaluation of the R-F Cam Cradle on the LongRangeOnly.com website. Reviewer Sam Millard uses the R-F Cam Cradle in the field with a variety of optics and rangefinders. 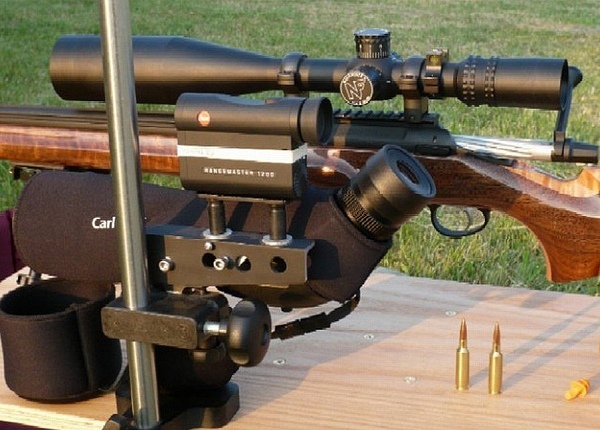 Millard explains how the R-F Cam Cradle conveniently allows combined use of spotting scope, LRF, and compact video camera. Share the post "New 3-Way Mount Holds Spotting Scope, Rangefinder & Camera"
Someone spending thousands of dollars on a once-in-a-lifetime hunt might consider getting Geovid rangefinding binoculars. Leica’s award-winning Geovid combines a superb binocular optic with a laser rangefinder AND a ballistic computer. With this single device you can spot your game, find the distance to your target, and calculate the elevation correction. Geovids even take a micro-SD card so you can upload your customized ballistics table. At around $3200.00 (street price) Geovids are very expensive, but for a serious hunter the Geovid’s capabilities justify the price*. The glass is excellent, the rangefinder offers outstanding performance, and you never have to pull out a PDA or mobile device to run ballistics. The Geovid even does angle correction and can output elevation click values. With the Geovid, you have one tool that does three jobs exceptionally well. When you’re climbing a mountain in pursuit of a Trophy Elk, carrying less gear makes sense. Now through October 31, 2015 you can save $300.00 on a new 8×42 Geovid HD-B, or 10×42 Geovid HD-B. That makes this state-of-the-art tool much more affordable. 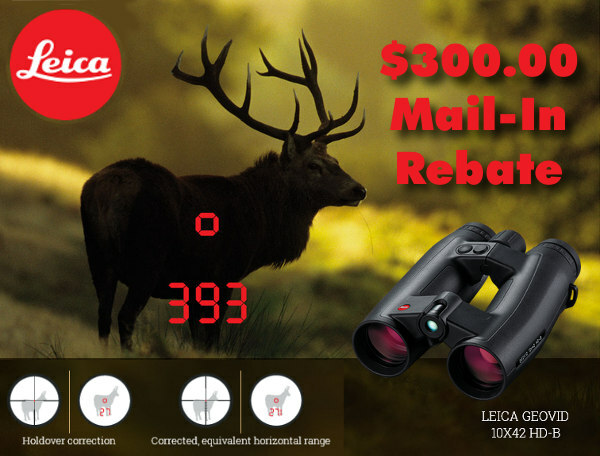 To get a $300.00 mail-in rebate from Leica, submit a sales receipt with the Leica Rebate Form. Share the post "Leica Geovid HD-B Rangefinding Binoculars $300.00 Rebate"
Forum member Scott S. (Sunbuilder) has built a sweet long-range varminter based on the 6.5×47 Lapua cartridge necked down to 6mm and then improved to 40 degrees, with slightly less body taper. Scott tells us that “improving the case adds about 2.0 grains to the case capacity”. This allows Scott to run the 103-108gr bullets at well over 3100 fps, with no pressure issues. Scott calls his Improved case a “Long Dasher”, a name suggested by Dave Kiff of Pacific Tool & Gauge. Scott designed and fabricated a very slick set-up to hold his Zeiss spotting scope and Leica CRF RangeFinder. He’s built a combo bracket that holds both units rock steady, with a parallel line of sight (same axis and elevation). Smart. Very smart. Scott explains: “I built a mount to connect my rangefinder to my spotting scope. The mount can be adjusted, so the spotting scope and rangefinder are both centered on the same object. The only way I have found to get repeatable long-range readings is to make them from a stable base.” Scott, we think you’ve got a winner here with your innovative and clever design. Share the post "The “Long Dasher” Cartridge, Plus a Trick Rangefinder Mount"
The “Whiskey” riflescope series is marketed as a rugged, affordable optical solution for hunters. Designed for law enforcement and tactical shooters, the “Tango” series of riflescopes feature 6X zoom ratios and meet MILSPEC requirements. 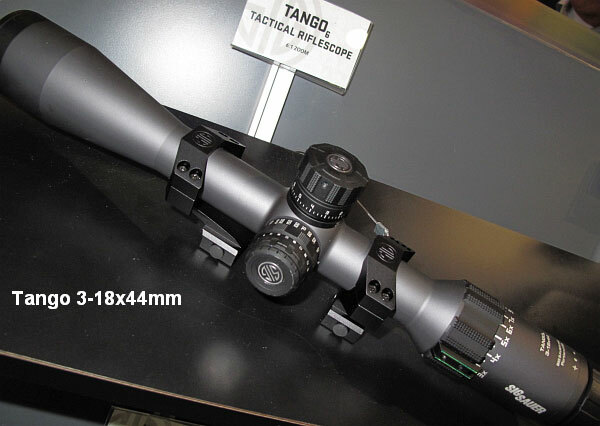 Shown below is the 3-18x44mm Tango. The “Bravo” series of prismatic battle sights (illustration below) are pretty remarkable. An innovative new lens design provides an exceptionally wide field of view. 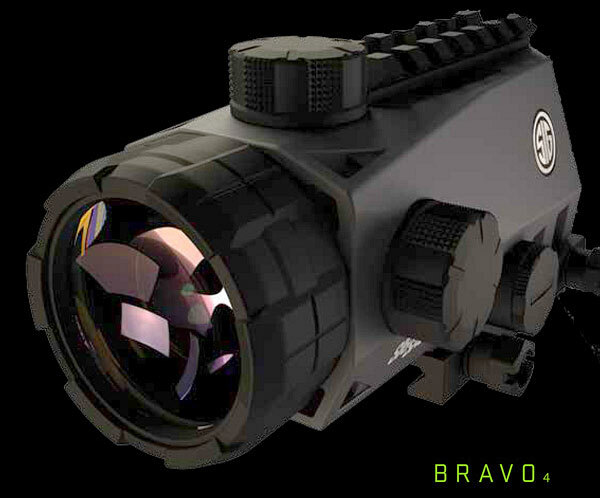 SIG claims that Bravo battle sights offer a 50 percent greater field-of-view than similar battle sights. The “Romeo” series of red dot sights are designed for tactical carbines. The miniature “Romeo1″ Reflex Sight is designed to be slide-mounted on a pistol, and SIG will offer several pistols with the Romeo1 pre-installed. For big game hunting or extreme long-range shooting, SIG developed the “Kilo” rangefinder series, the “Victor” spotting scope line and the “Zulu” binocular series. The “Kilo” rangefinder (bottom photo) can reach out to 1600 yards and features an auto-dimming display. It is about the same size as a Leica CRF, but it is easier to hold. 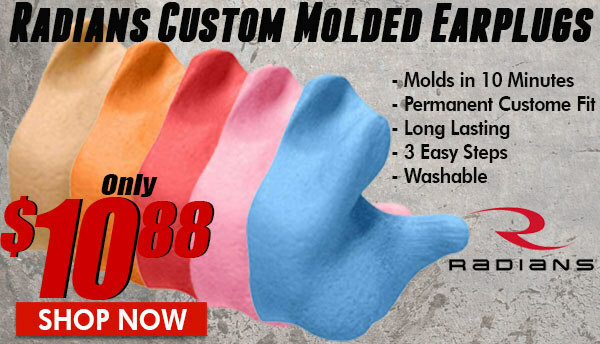 There are molded, rubberized finger grooves on the top and the whole unit has a nice feel in the hand. To learn more about other SIG Sauer products for 2015, visit the Shooter’s Log, presented by Cheaper than Dirt. For 2015, along with new handguns and rifles, SIG Sauer has rolled out a branded line of suppressors. SIG’s new cans should be popular with both tactical shooters and hunters (where suppressor use is allowed). Share the post "SIG Sauer Showcases All-New “Electro-Optical” Product Line"
Here’s a nice combo offer if you’re thinking about buying a laser rangefinder for the fall hunting season. Right now, if you purchase a Leica CRF 1000-R or 1600-B Laser Rangefinder you can receive a Surefire G2x-Pro flashlight worth $85.00. The rugged, dual-power G2x-Pro should last a lifetime. This is a limited-time offer works. When you purchase a new Leica CRF Rangemaster 1000-R or 1600-B Compact Laser Rangefinder from any authorized North America Leica Dealer you can receive a Surefire G2X-Pro flashlight and lanyard ($85 value). 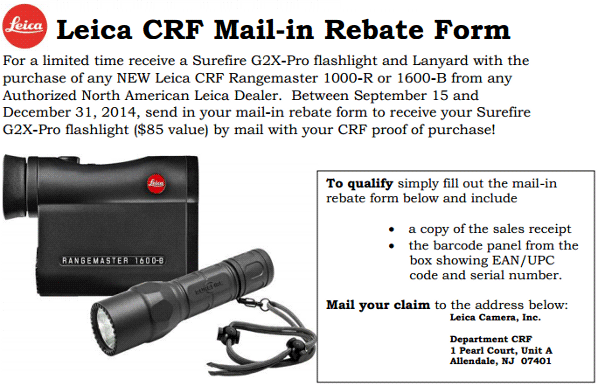 Send in your mail-in Rebate Form, plus your CRF proof of purchase, to Leica between Sept. 15 and Dec. 31, 2014, to receive your Surefire G2X-Pro flashlight. 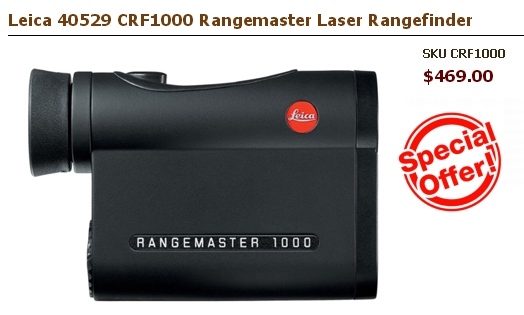 Leica’s CRF 1000-R Rangemaster is an easy-to-use laser rangefinder than can fit in your pocket. The wide field of view makes target identification fast and easy. The CRF 1000-R features built-in angle correction. This provides automatic point-of-aim correction for uphill or downhill shots. That’s a very valuable feature for hunters. Share the post "Get a Free SureFire Flashlight with Leica Rangefinder"
PrecisionRifleBlog.com recently published results from the most comprehensive field test of rangefinder binoculars ever conducted. It included virtually every product available in a variety of real-world scenarios, to see which had the best performance in the field in terms of both optical clarity and ranging capabilities. The results are based on over 10,000 data points collected from the field over 3 months of testing. Cal Zant, author of PrecisionRifleBlog.com, published a series of posts with exhaustive details about his optical and ranging tests and results, but we’ll hit the highlights here. Six of the models tested were binoculars, and the other two were monoculars. The Leupold monocular was included for reference, because many shooters have a 1,000-yard rangefinder similar to the RX-1000. The Vectronix Terrapin model was included as the control for ranging performance, because it is known to be an extremely accurate rangefinder (spoiler alert: it is). Cal provides a very detailed side-by-side spec comparison for these models in one of his posts. Each model was used to range 500+ times in a variety of scenarios from 25 to over 30,000 yards. The tests showed these models had similar performance at close and mid-range targets, but at 600 yards their performance started to diverge … so that is where most of the testing was focused. The chart below summarizes the ranging performance found on the test targets in ideal conditions, which was from a sturdy tripod, at sunset, with 10+ mile visibility. The exact target shape and surroundings varied, but the targets were all approximately 2 MOA wide, highly reflective, and perpendicular to the rangefinder. Specifics on target dimensions, view from the ranging position, and target surroundings are given in the detailed ranging performance results post. Vectronix is the leader of the rangefinder world, and that was proved once again in these tests. The new Leica Geovid HD-B wasn’t far behind them, with accurate ranging beyond 1 mile. The Zeiss Victory RF also had surgical precision off a tripod, although it had a reduced range compared to the Vectronix and Leica. The Bushnell Fusion 1 Mile also proved to be able to range targets out to their claimed max range of 1,760 yards. PrecisionRifleBlog.com also tested the ranging performance of each model in bright lighting conditions, and offhand as well. The data from those tests also contained a few surprises. To determine how accurate each model really was, Cal Zant carefully analyzed the results from each model when aimed at precisely positioned, “known distance” targets. To see how those tests turned out, or learn more details about specific models, GO TO full results. The Leica Geovid HD-B edged out the other models for the top spot, with its completely new, Perger-Porro prism design. The original Leica Geovid HD, and Zeiss Victory RF also showed great optical clarity. 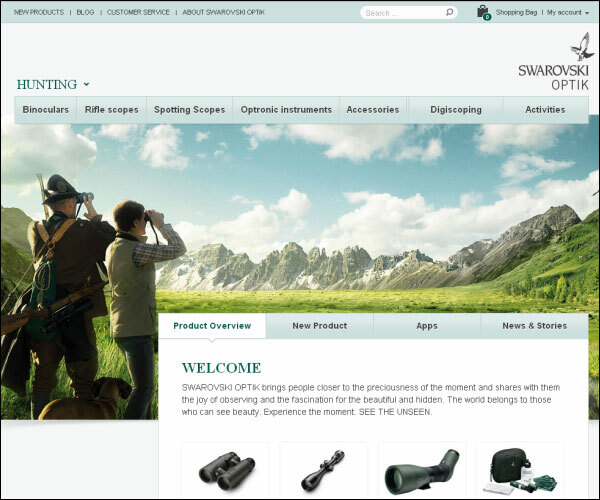 Share the post "Ultimate Range-Finding Binocular Test by PrecisionRifleBlog.com"
Swarovski Optik NA (Swarovski) has completely updated its website at www.swarovskioptik.com. The redesigned web page is divided into three main categories: hunting, nature, and travel & leisure. You’ll find in-depth product information with images, spec sheets and videos. There are easy-to-use, mobile-friendly links for Rifle Scopes, Spotting Scopes, Rangefinders (optronics), Binoculars, and Digiscoping Accessories. The enhanced site also features a Swarovski Blog with articles on optics products, hunting, and tech matters such as ballistics and lens technologies. Swarovksi’s updated website includes an “Apps” section with software for mobile devices and smartphones. Swarovski currently offers a handy, FREE ballistic calculator App designed for use with Swarovski Distance Reticles or the Ballistic Turret. This App delivers two types of outputs. For Swaro scopes with long-distance reticles, the App generates aiming points. For Swaro scopes with ballistic-matched turrest, the App provides click values for various yardages and wind values. 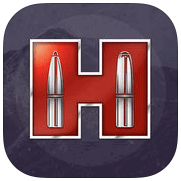 The App is available for iPhone, iPad, and for Android Devices. Swarovski also offers a free web-based Ballistics Calculator you can use from any computer. Share the post "Updated Swarovski Website Launched"
Looking for a high-quality laser rangefinder (LRF) at a great price? Well Eurooptic.com has slashed the price on the Leica CRF1000 compact LRF. You can now get the CRF1000 for just $469.00 — that’s deeply discounted from the previous price. 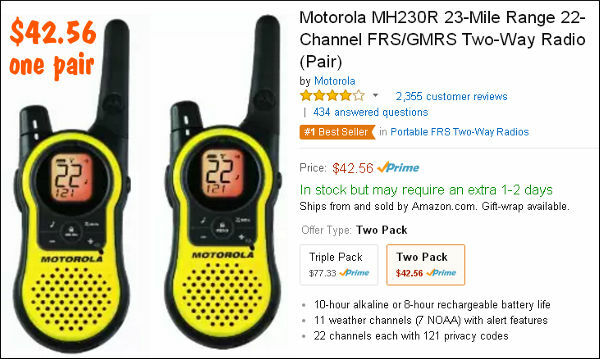 Weighing just 7.8 ounces, the 4.5″-long CRF1000 is very compact and can stow easily in a vest or jacket pocket. It offers 7X magnification, and a LED read-out that automatically adjusts to the light conditions. While not rated for as long a range as Leica’s top-of-the-line CRF1600B, the CRF1000 will work great for most users. In reality, very few people can hold a compact unit steady enough to range accurately on small objects past 1000 yards, now matter what the yardage rating. In fact, most users would have trouble holding their LRF steady enough to range a mule deer at 800. “I have been using the Leica 1000 CRF Range Finder for about six months. I have taken it on several hikes, hunting in Idaho… and on several Deer and Elk scouting trips. 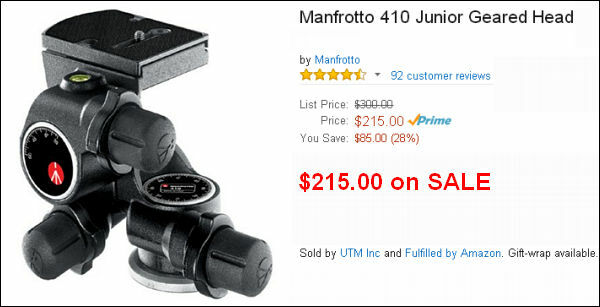 For the price of $599, I think the [CRF1000] is the best all around option for a range finder. Why do I say that? I can easily range animals out to 1000, just as advertised. It is EASY to use — push once to get the red box on target, push again and get an accurate range. It is durable. Along with range-to-target (in yards or meters), the CRF1000 model displays ballistics information for the user. It measures and displays both outside temperature and barometric pressure. It also displays recommended hold-overs for the ranged distance (based on load profiles selected from built-in tables). It will also measure and display the angle of shots above or below the horizontal. However, this unit, unlike the newer, more expensive CRF1000-R, does NOT automatically calculate the solution for angled shots, nor does it automatically figure environmental data into the hold-over. To get that functionality you’ll need the higher-priced CRF1000-R version. To reiterate — the CRF1000, on sale at $469.00, gives you temp/pressure data, and angle numbers, but you have to manually figure this into your shot. The model 40535 CRF1000-R costs $559 at Eurooptic.com. Share the post "Leica CRF1000 Laser Rangefinder on Sale for $469.00"